Here's the ergonomic setup that's currently working for me. 1. Keyboard: Kinesis Advantage ($300). These used to give me pain in my palms, until I started using SmartGloves (item 3). I like how this keyboard puts Ctrl and Alt on the thumbs instead of the pinky (which, if overworked, can lead to Emacs Pinky). I've also found the Microsoft Natural 4000 keyboard ($80) to be good; unfortunately it locates Ctrl and Alt at the pinky. 2. Trackball: Kensington Expert Mouse ($150). Using a mouse gives me various aches. This trackball doesn't, for some reason. 3. SmartGloves ($100). Keeps your wrists from bending backwards (pronation), by means of a hard foam strip down the back of your hand, and a beanbag under your palm. 4. Forearm support: rolled up towel ($0). 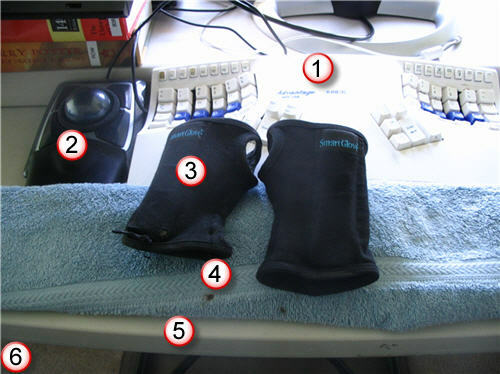 Inexpensive way to prevent forearm pain, especially with the 1.5"-tall Kinesis keyboard. 5. Table, 26" high. This is a good height for me, as it keeps my elbows at right angles. 6. (Not shown) Good office chair with back support ($150). posted by Jonathan at 12/24/2007 10:46:00 a.m. Interesting update. I do wonder Jon, have you ever thought about going back to basics, and a plain old keyboard - it seems a lot of the problems here stem from having a keyboard that is 1.5" thick. By Anonymous, at 12/24/2007 11:21 a.m. Thanks Paul. After watching my bro playing around with Garage Band on his MacBook, I'm definitely more inclined to switch at some point. Alas, the Mac keyboards have Ctrl and Alt and Shift at the pinky. But the Kinesis will work with the Mac anyway. By Jonathan, at 12/24/2007 2:32 p.m. I have a friend who was in the military and he consistently uses the keyboard and mouse incorrectly, i.e. moving mouse with wrist instead of arm. He never had any health problems related to this bad usage. The reason for this is that he exercises everyday. Lifting weights daily can prevent many of the common problems associated with computer usage. By Johan Cyprich, at 2/08/2008 6:00 a.m.
Good point about exercise, Johan. By Jonathan, at 2/08/2008 8:40 p.m.
great blog, lots of good stuff! By Olivier, at 6/11/2008 6:40 a.m.
Haha - yeah, very true Olivier. By Jonathan, at 6/12/2008 12:39 a.m.